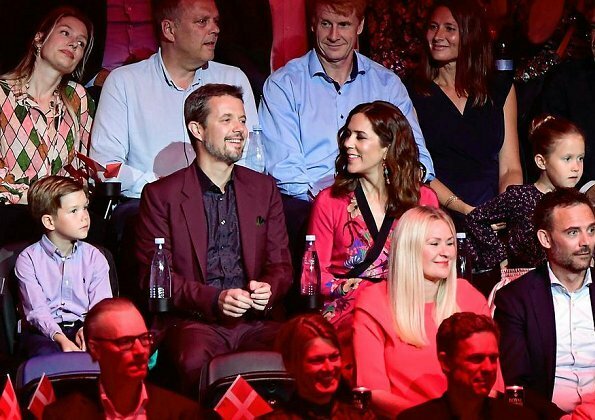 In connection with Crown Prince Frederik's 50th birthday celebrations, “All of Denmark celebrates The Crown Prince” concert was held at the Royal Arena in Copenhagen on May 27, 2018. 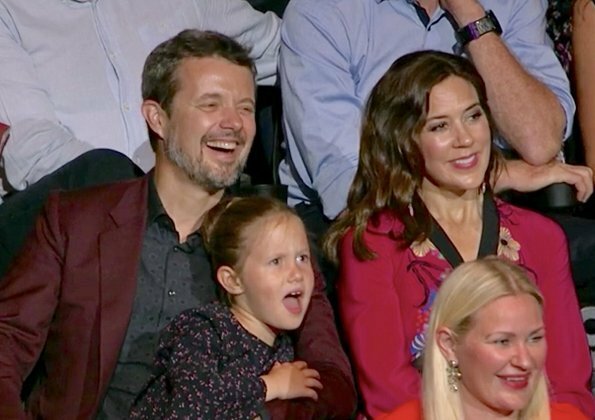 Crown Prince Frederik, Crown Princess Mary, Princess Isabella, Prince Christian, Prince Vincent, Princess Josephine, Prince Joachim, Princess Marie, Prince Felix and Countess Alexandra attended DR TV Channel's show called as “All of Denmark celebrates The Crown Prince”. 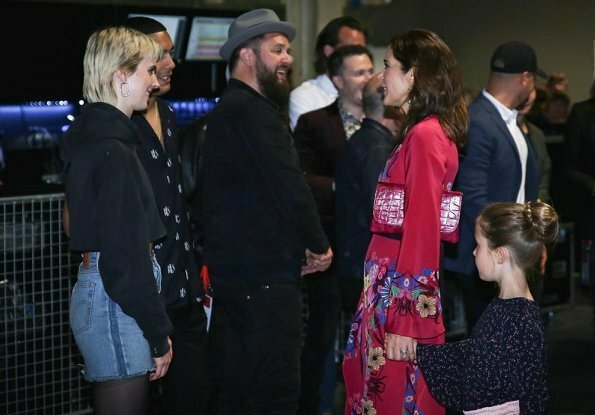 The Danish band Lukas Graham and the Danish singer Oh Land were among the performing artists. Mary always stunning! Lovely family! Great to see CP Frederick smiling. Woow, me encanto como se ve Marie, definitivamente se ve increíble con ese vestido! Still celebrating the Birthday now with a concert. Everyone looks good I must say the children really grow fast, it is nice the bigger ones interact with the smaller ones.Nice family. Marys dress is Asian inspired she looks good in it. Pss Marie looks very good too,everyone is so happy that is nice to see. For the first time ever I like Marie's outfit a lot more than Mary's. They both look nice but if I had to choose I like Marie's more. 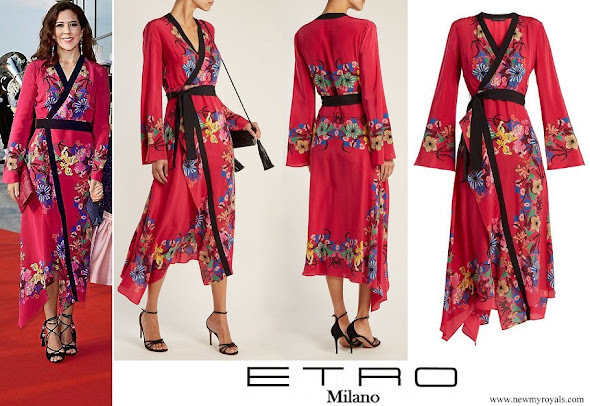 Wrap dresses like that, especially if shiny satin or silk, will always look like a morning robe. 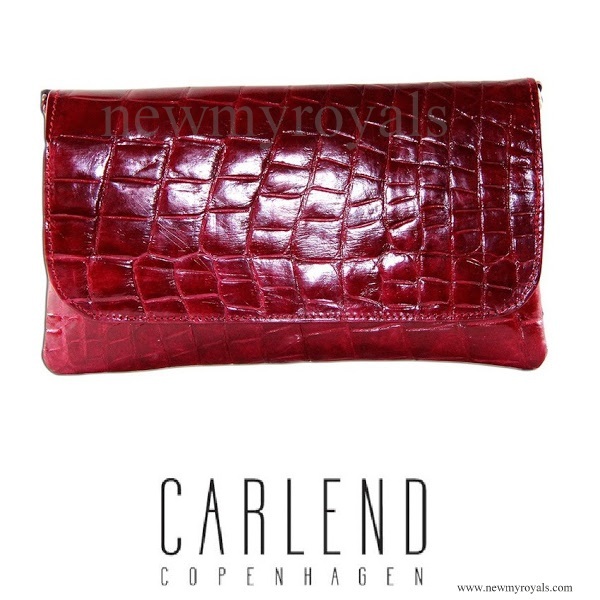 There is nothing you can do to change that, no matter how you style it. 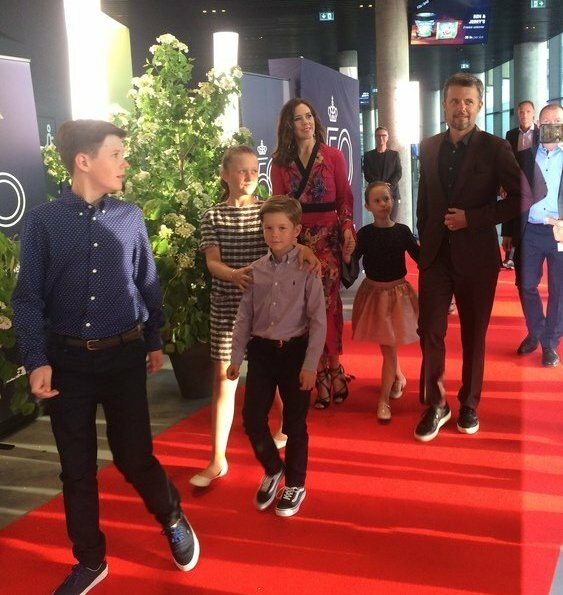 Also, I´m all for a more casual approach, but Fredrik´s sneakers don´t look right with his outfit. There are better shoe options for a casual/smart look if you don´t want to go full suit+tie. Joachim´s got it right. Oh, and Marie looks smashing. Aside from the black trim, I do like Mary's dress. But Marie really looks smashing!! How wonderful to see this family so relaxed and happy! I love the dress and I particularly loved her speech at her husband’s 50th birthday. It is on YouTube and is very touching and amusing. She said when she first saw her husband in full formal attire, she felt she was pushing above her weight (or words to that effect). I think he is lucky to have married a clever and elegant woman. Marie! !😲 Yes, she can 👍 !!! 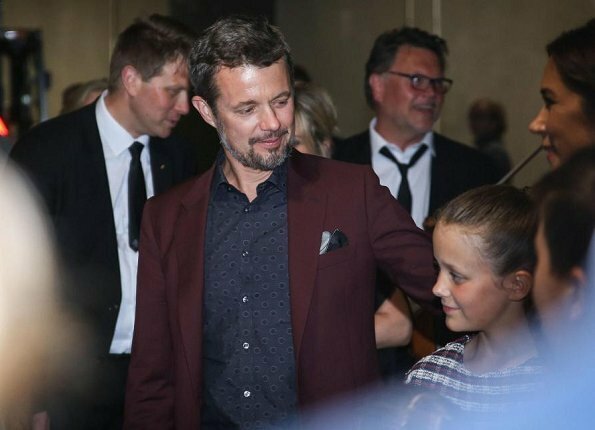 Happy 50th Birthday to Prince Frederik of Denmark! 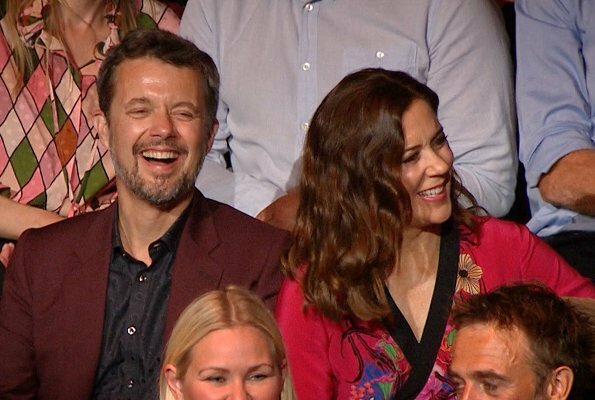 It is very nice to see beautiful smiling faces of Prince Frederik and Princess Mary of Denmark. So, the celebrations are over now. What wonderful events we have seen. And, because this is it, what this blog is about, beautiful fashion. This wonderful asian inspired wrapdress and the aquazurras are wonderful items for this concert. I am sure, the family had a splendid time and will embrace the memories of Daddys 50. in their hearts! Joachim loves to be photographed with his beautiful Marie, but the problem is, that the photographers would like to have some pictures of Marie alone for the use on fashion blogs! I read a comment where a photographer complained about it, hehe ! No and no again.....the dress is a bathrobe.Maybe if she was 20,but she is not. No me gusta como van vestidos en particular Federico y Mary cuestion de gustos. Such a beautiful family, gorgeous children. All growing up so fast. Mary looks lovely as always and much to my surprise Marie has chosen another very flattering dress - very nice! Mary looks stunning, suitable for the event. everyone goes colorful Marie's dress to somber.